Even though physical-book libraries are increasingly anachronistic, well, you've still gotta have a place to stash your books. But getting the right amount of bookshelf real estate can be tricky - not enough space and your books overflow, but too much and you library looks embarrassingly sparse. 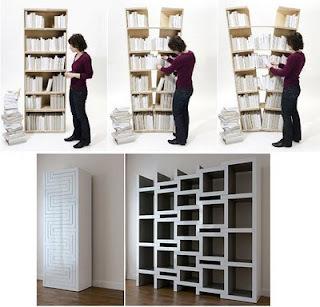 So here are two solutions: bookcases that start small and expand to accommodate more. Pictured at top is the Platzhalter, a lighthearted piece more appropriate as a conversation starter than a piece of furniture. At bottom, though, is the more reasonable REK bookcase - something that may actually look at home in the home. Not bad - and not a bad idea!